Yahoo! Messenger 7.5 and Yahoo! Messenger with Voice 8 is the install messaging client from Yahoo! which now able to exchange and send instant messages to Windows Live Messenger’s users. Like Windows Live Messenger, Yahoo! Messenger has all the best features, with lots of advertisements and animated ads. If you don’t like the ads and wants no ads on Yahoo! Messenger window, there are few ways that allow you to remove the advertisements. Ads in Yahoo! Messenger can be removed by manually editing the registry. Launch Registry Editor (Start -> Run -> Regedit). If the registry key doesn’t exist, simply create a new String Value registry key with the name by right clicking on the above registry branch and select New -> String Value. Close Registry Editor and launch Windows Explorer. Save the empty urls.xml file (it should be an empty file). Change the attributes of urls.xml to Read-Only by right click on the file and select properties, and click on Read-only. Note: You can try only the step 5 to 9. If it’s working, then other steps are not necessary. The patch should works for most version of Yahoo Messenger including version 7, 7.5 and 8. Google Operating System has make a batch file that will automate the above process. If you want the automated way to disable the annoying animated ads in Yahoo Messenger, download the batch file here. If you still unable to turn off advertisements on Yahoo Messenger, try to download YM Ad Patch which remove the advertisement from the bottom of the contact list, the advertisements in various other places of Yahoo! Messenger and another patch and trick that allows users to run more than one instance of Yahoo! Messenger. 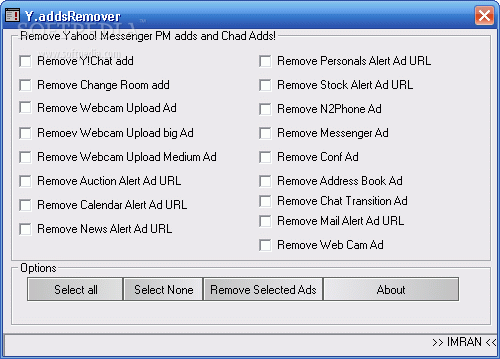 There is also a free tool called Y.AddsRemover that removes ads on Yahoo! Messenger ad, Yahoo! Chat ad, YM PM ads and many others. Y.AddsRemover allows users to pick which ads they want to remove. To remove all Yahoo! Messenger Ads, just click “Select All” after start the program. Apply the patch by clicking on “Remove Selected Ads” to hide the ads. Update: For Yahoo! Messenger version 8.0.0.701 and above, the above tricks no longer work. Use the new patches instead.